30 Reasons(& Photos) to Love Monsoon, from a decade of Chasing Rains in India! ~ The Wandering Soul's Wander Tales..
30 Reasons(& Photos) to Love Monsoon, from a decade of Chasing Rains in India! Born in the month of June on a day when heavens opened up like a flooded reservoir, my parents tell me my name is inspired by the dark blue of a stormy evening. Perhaps that why I have always felt a strong connection with the monsoon. On all those monsoon Sunday afternoons where my family huddled up in the living room watching the special movies telecast on DD National, I remember sneaking outside, trying hard to make sense of the deep nostalgia the rains evoked in me. A child (and an adult) with a hyperactive imagination, I weaved strange stories of a past life to explain to urge to drop everything and watch when it rained. Two decades later I was still no where close to understanding that obsession but I learned I didn't need to understand it at all. I could just revel in it instead. Since then, I've spent the next decade chasing monsoon every year in every possible corner of the country, filling up a jar full of memories tinged with stormy skies and surreal views. #1 because sunny days may be beautiful and all that but they are no match to the spectacle of a monsoon sky! There are few sights as glorious as the ephemeral minutes between black, roiling clouds morphing into a thick curtain of rain. #2 because rivers come to life and how! Rivers flow where there were none and where they were, they thrive. There's no greater joy than a flowing river and love how monsoon makes it happen. #3 because thunderstorms light up the skies with an ardent fervour! A normal person would probably balk at the idea but I personally love it when I get to witness the freakish glory of nature's fury, like flashes of lightning and loud thunder piercing the stillness of the night. #5 because it rains even in the desert and it is nothing like we've imagined. It's plain gorgeous! #6 because wild flowers come into existence! You see, delicate flowers growing wild and free is the ultimate testament to a region's pristine condition in my book. 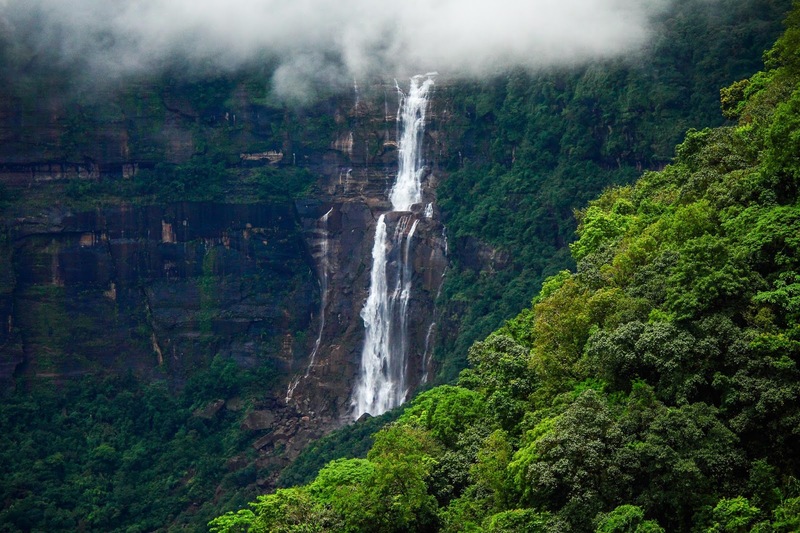 #7 because waterfalls big and small get a new lease of life and spring up everywhere, from mountain slopes to road sides. #8 because the romance of going on a long walk a on rainy day and feeling the force of monsoons through the flimsy comforts of an umbrella is enough to make us forget all our blues! #10 because misty morning scenes set amidst lush greenery that seem straight out a fairy tale play out in the monsoon months. #11 because when it rains, a gorgeous brook like this is just a stop-by-the-roadside away! No more hiking in dense jungles in reach a tiny trickle, monsoon magic at your doorstep if you will. Oh my god, Sonki, these tiny yellow flowers literally carpet the entire Sahyadris during monsoons. I have never ever seen flowers mass bloom to this extent, they were everywhere during my trek to Ratangad one monsoon. Vast swathes of the upper reaches were packed with these flowers, so much that you could see streaks of yellow from a kilometer away! #13 because it gives us a reason to let the inner child out. Look at me frolicking around that gorgeous tree without a worry in the world despite having a long ride in the dark waiting after this to the homestay. #14 because there's no better time to go on a road trip! #15 because the parched lands get a new lease of life and we only have the rains to thank for that! #16 because you can see it happening, a trickle becoming a roar. That's how you know everything is coming alive around you, when it rains. #17 because even dull and boring towns can look pretty when it rains! #18 because even deserts sprout greenery when it rains. And the fact that it is ephemeral, makes it all the more surreal, like this oasis in the middle of a desert. #19 because you can see that favorite mountain of yours is changing colors for good, soon it will all be glistening in a lovely shade of green that only rains can paint! #21 because there's an unfathomable charm to scurrying away from pelting rain and thunderstorm to hide under a ridiculously small tree, seeking protection from the glorious fury unleashing above you! #22 because 'tis the season for hiking! There's no better time to hike in the Sahyadris but monsoons, unless you are rock climbing of course. If the forests of Karnataka maintain some semblance of greenery even during harsh summers, Sahyadris are depressingly bone dry and barren brown in every other season except the rainy season. And what a blasphemy it would be to miss its glorious beauty when it rains! #24 because the sustenance we so need gets its sustenance during the rains, just look at those lush fields and the gentle flow of that seasonal river! #25 because the abundant rains paint not only the earth green, but also water! Monsoons bring out the beauty in almost everything, don't you think? #26 because monsoons show you a new side of a destination you didn't give a second thought to earlier but now you cannot believe you didn't see this beauty all along. #27 because when a ghostly veil of mist ensconces the landscape, it hides the ugly gashes of civilization, making everything seem all the more alluring. #28 because forts inundated in lush greenery have won my heart ever since Mani Ratnam showed the beauty of moss-ridden ancient walls in Bombay's "Tu hi re". #29 because it is otherwise impossible to trace the contours of the deep chasms and ravines of our favourite mountains if not for the fleeting monsoon clouds that effortlessly slip in and out of these inaccessible geological features! #30 because monsoons do not represent gloom and doom to me, like it does for many. It only makes me happy, immensely. So tell me in the comments! Your stories, favorite photos or reasons from my list, to love monsoons? I know what you mean! Those few moments when the clouds swirl and build up before pouring down is pure magic. Wow. You have really made me fall in love with Indian monsoons. Every picture here speaks of the glorious time rains bring. Lovely post. Loved this post as much as I love the rains. The photographs are spellbinding. Love all of them. Excellent photographs! Your pictures will make anyone fall in love with monsoon! Lovely pictures Neelima. Visting north east in monsoons is on the cards; hopefully, next year. #31 Because the color green changes from plant to plant. One more thing I would like to add that you posted very beautiful pics. Monsoon is one of the best season to enjoy beauty of india. It is best to enjoy and you captred stunning photos of india. Its really amazing work to done. Great collection. Some of them I have been to, some of them I plan to. And then there's a new addition to my wish list - Shettihalli. Never heard of it before, but looks stunning. Great and Amazing photos gallery. I would like travelling to visit in North India to enjoy this monsoon.